« After Sonos, what’s next? 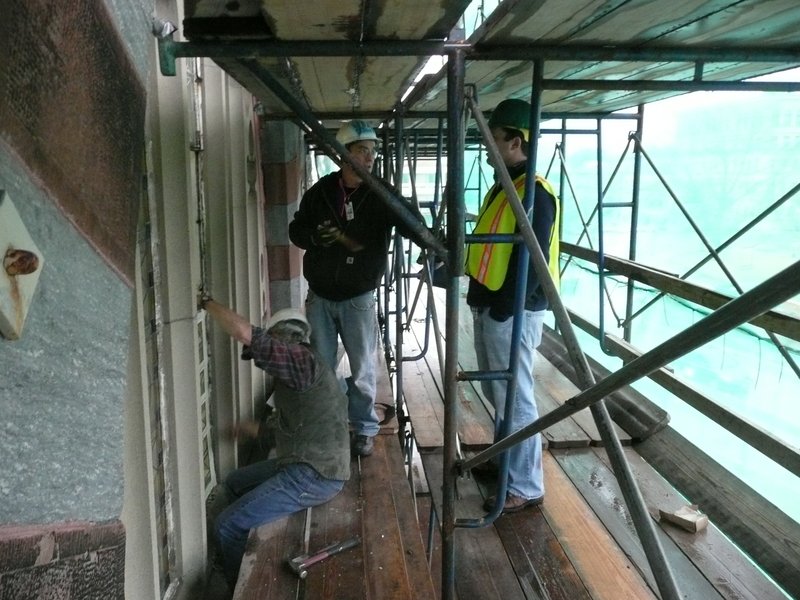 On the scaffold, behind the curtain, preparing to remove the stained glass panels. Photo, the author. There are stories behind the green curtain that people walk and drive by each day. It’s not just the five stories of scaffolding that the curtain shields for the ongoing preservation work of the old Berkshire Athenaeum on Park Square in Pittsfield, Massachusetts. It also shields stories related to the complexity of preserving this building, stories about its benefactor and architect, and stories narrating the evolution of the city. Above the front entrance to this Victorian Gothic monument is an inscription that reads “This tribute to science, art and literature is the gift of Thomas Allen to his native town.” Thomas Allen, a railway baron before there were such men, moved out of Pittsfield and did go west, to Missouri, where he set himself up in the railroad business, and then ran for state office to help get the legislation needed for land acquisitions. He predated Andrew Carnegie by decades in donating the money for a new library for the town in 1874. Allen selected the design of William Appleton Potter, a young architect from New York who specialized in Victorian Gothic buildings: grand, ornamental Gilded Age structures, permanent grey and brown stone monuments, with pointed arches, skylights, gables and stained glass windows. Potter had designed the library at Princeton University, and the two men shared a Union College connection. Perhaps, though, it was through Potter’s brother-in-law who was the sculptor of the Civil War soldiers’ memorial on Park Square that Thomas Allen became acquainted with Potter’s work. Allen had been a donor for that statue as well. At the dedication to the library, Thomas Allen revealed his hopes for the new building: help save the nation. He could have been thinking of the Civil War, as the soldiers’ memorial erected just a few years earlier was in plain sight across the park. He also had in mind the new immigrants in the town’s mills and factories and their children who would learn the ways of their adopted homeland through the library. As impressive and unique as it was, the building suffered from both structural and space inadequacies almost from its beginnings. Twenty years after its opening, the library’s leaders were complaining about water leaking and insufficient space for books. A new addition and a new museum left more room for books, but many in the library and the city spent the next half century clamoring for a new library. The building survived, serving a population growing with the success of its chief employer, General Electric, and outlasting calls for its demolition. With urban renewal of the 1960s claiming whole blocks of buildings just one block away, the Athenaeum escaped unscathed. By the time the funding became available for a new library, the country and the town had turned the corner in its appreciation for historic buildings. A new library was built a block away, but this building was re-adapted for a courthouse and registry of deeds. As one of 8 historic structures, the Park Square historic district received approval for placement on the National Registry of Historic Places in 1975. As such, it has helped sustain a downtown that has suffered loss of business and consumers since then. Pittsfield’s efforts to revitalize its downtown over the last two decades have relied on the presence of its historic buildings that offer an attractive and authentic vitality to the city. Its structural problems remain, however. One engineer assessed the situation in the 1970s simply: William Potter was trying to do too much, too many roofs, too many places for water to seep behind the stones and through the skylight. As the water would freeze and thaw, it would open up more space for water to seep, increasing the bulging. Major structural repairs, including steel ties across the front and side elevations, were required for its stabilization in the 1970s. Again in 2001, the rotting skylight was restored, the roof was replaced and new internal drains on the roofs were installed. Still, by 2011, the bulging on the front had increased dramatically, as much as five to six inches in places. In September 2013, the state embarked on a major stabilization effort, with plans to remove most of the masonry and stained glass on the front façade. A complicated system of anchors will hold the re-laid stones in place to a reinforced back-up wall. A simple enough sentence, but documenting and removing each stone, storing them off-site, installing new steel supports, repairing the brick back-up wall, re-laying the stones and inserting anchors and grout to hold them in place, is anything but simple. The movement in the wall took its toll on the stain-glass windows, so a similar process of documentation, removals and repairs is underway as well. All work is specialized to ensure the historical integrity of the building, matching colors and textures as closely as possible to the original design. This effort will save the stories of the old Athenaeum for future generations, so they will be see in the building, stories of their immigrant, working class ancestors who made this one of the busiest libraries in the state, stories of a golden age of prosperity when wealthy elites felt a civic debt to their communities and stories of a misguided urban renewal scheme that demolished entire blocks of the city, but somehow managed to overlook this building, with the help of another generation of civic-minded individuals. All that behind this green curtain. 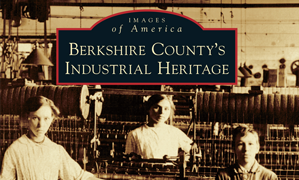 This entry was posted on April 17, 2014, 12:56 pm and is filed under Berkshires, History in our surroundings, Preservation, Public History. You can follow any responses to this entry through RSS 2.0. You can leave a response, or trackback from your own site.